Thomas Chan and Carly Wade. Photo courtesy of Carly Wade. A very nervous psychology professor, Thomas Chan, guided his girlfriend, Carly Wade, down the Lilac Hall hallway at California State University, Northridge. Through an augmented reality (AR) headset worn by Wade, the hallway transformed into an art gallery lined with portraits of the couple’s dearest times together: the pair leaning over a dinner table to take a selfie with close friends in Washington, D.C., in the bleachers at a Baltimore Orioles game, and making goofy faces while eating ice cream cones. In the background, Wade could hear their song, “Corners of the Earth” by ODESZA. At the end of the hall, she came to a table. She was greeted by virtual woodland creatures: a small deer, a frog and a bird flapping its wings. 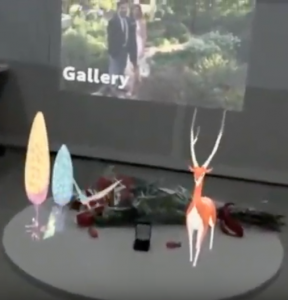 These holographic woodland creatures, surrounding an engagement ring, were projected through an AR headset worn by Carly Wade. And on the table, a ring. In tears, Wade nodded yes, and they embraced. Thomas Chan on one knee popping the question following his augmented reality presentation. Photo courtesy of Carly Wade. 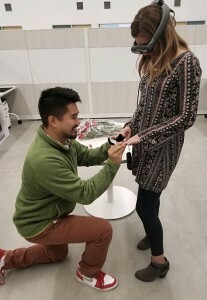 To propose to his beloved, Chan harnessed AR technology, which enhances the real world by projecting holograms in real-world environments through a headset or other device. A popular example of AR technology was the Pokemon Go smartphone game, which projected Pokémon cartoon characters onto real-world settings. Chan and Wade met in Maryland while working on their advanced degrees: Chan was finishing a postdoctorate in epidemiology, biostatistics and mental health of aging at John Hopkins University, while Wade, now a mental health therapist, was working on a master’s in clinical social work at Salisbury University. Their first date, much like their proposal, was enabled by technology — an online dating app. “After our first date, I told my sister, ‘This is the man that I think I am going to marry,’” said Wade. “I like what I guess you can call his ‘joie de vivre’ — he’s always very positive, motivated and ready for an adventure. “He inspires me to be a better person and has demonstrated his desire to build a supportive partnership that works for the both of us,” she said. Chan had a specific goal in mind with his proposal. “I wanted to guide Carly through our past together, to the present and then towards our future,” he said. There were many challenges with Chan’s proposal, primarily the fact that he knew no one else who’d done it — and no one to ask for advice about pulling it off. 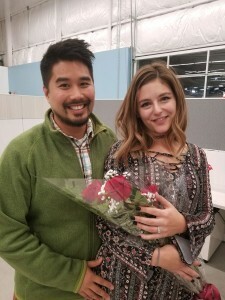 With the help of his friend Danny Matook, lead developer in CSUN’s Positive Aging and Research Lab, Chan spent the week leading up to the proposal coding the program and fine-tuning his bride-to-be’s virtual journey. The couple plan to get married in fall 2019 at the Delaplaine Visual Arts Education Center in Frederick, Md., one of Wade’s favorite childhood locations, with a space-themed twist to the event because of their mutual love of astronomy. They plan to use AR technology. A full video of the AR proposal is available on YouTube.